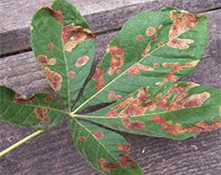 The chestnut leaf blotch is host to Horse Chestnut and Buckeyes. Lesions first appear as water-soaked irregular areas that enlarge rapidly. Within a few days they turn into reddish-brown blotches, usually with a yellow border that merges gradually with green tissue. Small lesions may be limited by veins. Large lesions frequently coalesce and cause premature defoliation. Blotches appear on the leaflets and leaf stalks by mid-summer. Infected leaves turn brown and may fall early. This pathogen overwinters in diseased leaves. Fungal spores produced on these leaves initiate infections the following spring. Numerous, pinpoint, black fruiting structures of the fungus develop in the blotches. These fruiting bodies serve to distinguish leaf blotch from scorch although both diseases may be present on the same tree. During wet periods in summer, the fruiting bodies called pycnidia, produce spores which initiate more infections and cause further spread of the disease. For this reason leaf blotch tends to be more severe in seasons with frequent rains. 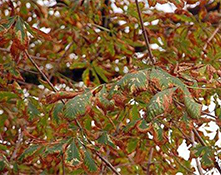 The impact this disease has on the overall health and vigour of an infected tree is minimal since symptoms rarely develop before mid-summer, after the trees have put on the season’s growth. The disease however reduces their aesthetic value. Gathering and removing fallen leaves will provide good control. The leaves can be composted, buried, burned or otherwise disposed of.